Road movie à l'humour sans finesse dont l'intrigue mince repose sur la sempiternelle formule des caractères opposés, Due Date bénéficie toutefois d'une réalisation compétente de Todd Phillips. 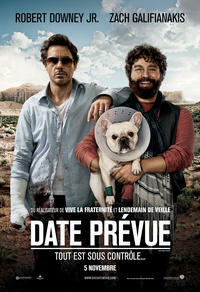 Due Date is a handsome copy. A project produced and directed by The Hangover's Todd Phillips, the movie's DNA features the same blend of flawed machismo, paternal sensitivity and boyish inanity as its predecessor - only this time, wrapped around a road-trip device. So Due Date ends up as a movie in which a couple of characters it doesn't really seem to understand journey across the country encountering a series of mostly unrelated, funny bits. Mr. Phillips likes to push studio comedies to the edge of mainstream acceptability, retrofitting old ideas (here, Planes, Trains and Automobiles) with new-school aggression and obscuring his social conservatism under the fig leaf of calculating comedy. Still, when it's funny, it's damn funny, making it well worth seeing as long as you don't mind the fact that the protagonists are both kinda dicks. Oh well, at least they're funny, which, after all, is the point. Une grosse farce qui tient la route pour ceux et celles qui aiment bien se dilater la rate sans effet secondaire. Et ne serait-ce des deux formidables acteurs en présence, Due Date ne lèverait pas. Parce que, contrairement à The Hangover qui allait de surprise en surprise, il n'y a à peu près rien là qu'on n'ait jamais vu, par bribes, dans d'autres comédies. The grudging bond that develops between Robert Downey Jr.'s uptight architect and Zach Galifianakis' slovenly wannabe actor in this buddy/road trip comedy fires on most cylinders.